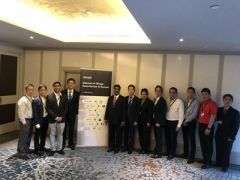 HO CHI MINH CITY, VIETNAM, Apr 26, 2018 - (Media OutReach) - Global technology-solutions provider Arrow Electronics hosted an internet of things (IoT) technology seminar with solutions showcase today at the Sofitel Saigon Plaza in Ho Chi Minh City. The event, through a combination of technical sessions as well as live solution demonstrations, provided insights and a roadmap on how to adopt and integrate the latest IoT technologies for smart city, smart agricultural and industrial applications. Delivering the opening speech at the event, Mr. David Trieu, project director of IoT Vietnam Ecosystem said, "Technology know-how sharing sessions like this one is providing an exceptional opportunity and effective platform for local ecosystem partners and stakeholders to acquire the best-in-class IoT technologies and engage in face-to-face discussion with technical experts for adopting best practices and successful implementation." "Developing intelligent and IoT-enabled devices draws upon the ability and expertise to aggregate and integrate diverse technology, from sensors to sustainable and secure end-of-life cycle disposition," said Mr. Natarajan MM, vice president of sales, South Asia for Arrow's Asia-Pacific components business. "With our global IoT capabilities, world-class design engineering support, and supply chain expertise, we help IoT engineers, practitioners and implementers overcome technical challenges and accelerate IoT deployment in the region." Arrow's comprehensive sensor-to-sunset portfolio ranges from sensors, wireless connectivity, gateways to cloud platforms, data ingestion, aggregation and visualization, analytics, and security. Service capabilities span ideation, design, integration, manufacturing, logistics, financing, marketing, monitoring and managed services, and sustainable and secure end-of-life cycle disposition.